The importance of grain to the farmer or cultivator could be likened to the importance of a statue or waxwork to an artist or sculptor. You just cannot afford to let the artistic work go to waste- isn’t it? It’s perseverance implies it’s coming to maximum profitable use. That same way, one cannot stand the idea of the food grains not being stored properly and safely. The next importance and obvious step is where to preserve the grains? To be frank, there are a lot many advantages of using the steel silos for grain storage vis-à-vis using the warehouses for storage. For starters, you’d rather use a vertical storage platform for storage of the food grain as compared to any other. When it comes to storing the food grains in a warehouse, then it means their storage in a horizontal format. Using steel silos for storage of grains makes way for availability of more ground surface area. The simple reason being vertical storage structures occupy less ground surface. So you can do whatever you wish to with the surface area that’s left. 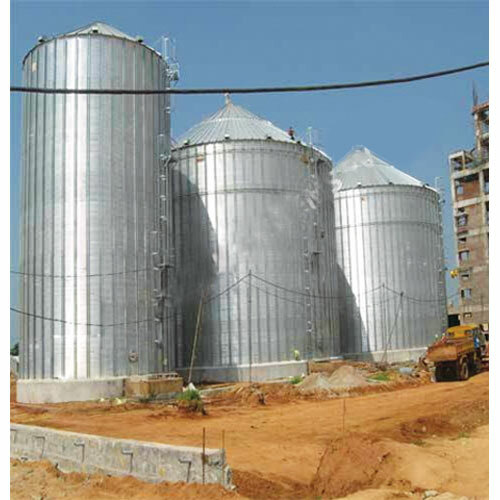 Steel silos for grain storage is also a cost-friendly and an economical method. Well, the lesser space you take for storage, the lesser rent you pay on account of the slot booked for storage- isn’t it? Another reason that points to the economies of scale is that when one uses the steel silos for grain storage, one needn’t incur an additional set of costs as what one would in the case of opting to go for a traditional warehouse. It’s pretty simple. In the case of the latter, one needn’t undergo the process of automation of the grain transport equipment. The assembling costs, when using steel silos vis-à-vis the warehouses is much lesser. So that’s another automatic choice for the farmers and storage experts- isn’t it? Fundamentally, stainless steel storage containers are also a better solution for storage of the food-grains, from the perspective of long-term reliability. At the end of the day, the greatest cause of concern in front of a farmer is that of ensuring the safety and sustenance of his produce, which in this case, means the grains. Not only is the avoidance of plastic and other material such as concrete a better solution in terms of environmental aspect, but also it pays to store the grains in steel silos. It’s a well-established fact that using silos that are made of the stainless steel material is a big positive for the environment because the material isn’t known to add excess to the degradation. And Rostfrei Steels Pvt. Ltd. is one of the major cost-effective steel silo supplier in industry. It’s cost effective in the process of manufacturing and at the end of the day, the farmer and producer wants something that can uphold and protect the grains more reliably. That aspect is covered thanks to steel silos being of a higher tensile strength. And when that aspect is ensured, why would anyone opt for another storage material.